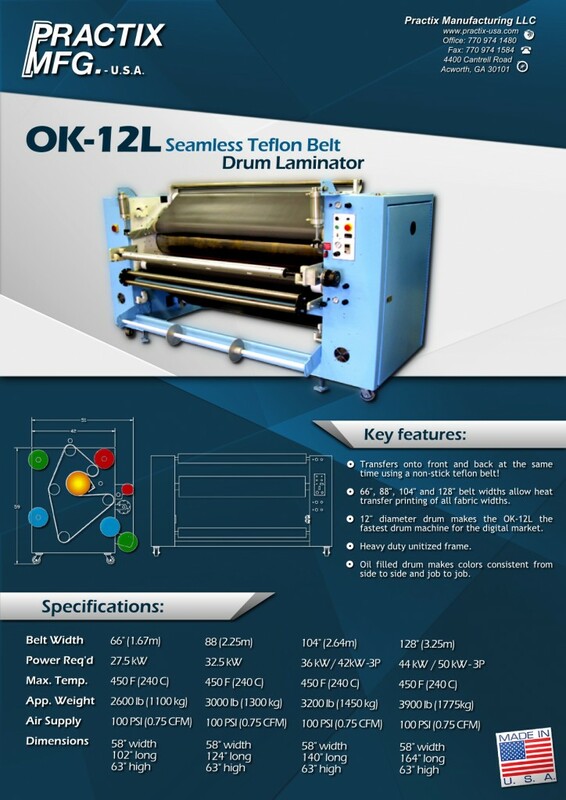 The OK-12L is a dual propose machine very well suited for laminating fabrics as well as traditional Dye sublimation and the fixation of inks. The woven endless Teflon coated belt and the pressure roll make this machine a very high performance laminator. With NIP roll presses you can laminate a wide variety of fabrics to foams with a thermoplastic web adhesive in the morning and sublimate in the afternoon. The OK-12L is available with a chill plate that will increase the performance of technical and ballistic fabrics. Interested in checking one out, please feel free to look us up. All of our machines, including the OK-12L, come backed by a one-year mechanical and six-month electrical warranty. Plus, Practix machines are fully customizable to meet the size and color requirements of your facility.